A linear footpath following the old tow path of the New Cut Canal completed in 1821 to bypass a large bend in the River Mersey and part of the Irwell and Mersey Navigation. 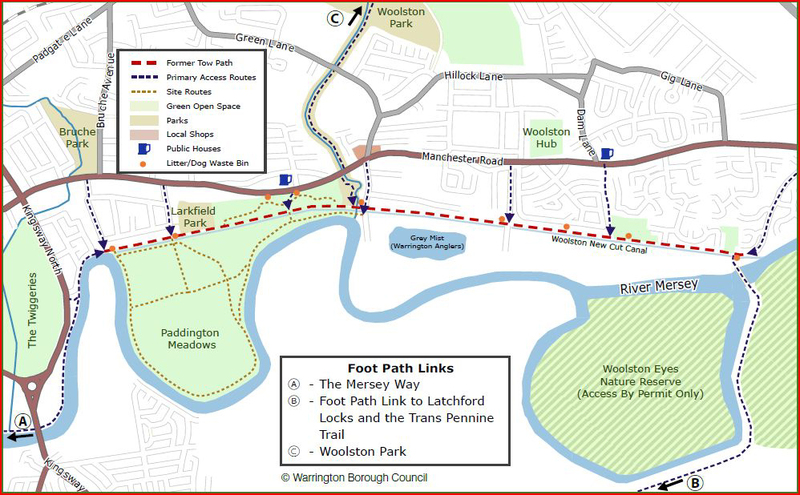 The path starts at Paddington Bank and runs for 3 kilometres to Weir Lane, Woolston. Along the way passing Paddington Locks, Paddington Meadows Nature Reserve, Larkfield Park, The Ecology Park, Woolston Park South, Grey Mist Mere, Nottingham Close Play area , the site of Woolston Locks and ends at Woolston Weir Pool. Further information on all these locations is to be found on the New Cut Trail Leaflet.